Deze synthesenota is de allereerste poging tot nog toe om een panoramisch overzicht te geven van de rol en het belang van de instellingen voor het hoger onderwijs (IHO) in Brussel, hun wisselwerking met de stad en de stedelijke ontwikkeling. Deze synthesenota bestaat uit drie afzonderlijke delen. Het eerste deel schetst het Belgische institutionele en politieke kader waarbinnen de instellingen voor hoger onderwijs in Brussel functioneren. Het tweede deel bespreekt een reeks vaststellingen. Het derde deel snijdt enkele grote uitdagingen en debatten aan, gerelateerd aan de instellingen voor hoger onderwijs in Brussel. Cette note de synthèse est la première tentative réalisée à ce jour pour cerner, de manière globale, le rôle et l’importance de l’enseignement supérieur à Bruxelles dans ses interactions avec la ville et le développement urbain. La note comporte trois parties distinctes. La première précise le cadre institutionnel et politique belge dans lequel fonctionnent les institutions d’enseignement supérieur à Bruxelles. La deuxième établit une série de constats. La troisième partie aborde quelques grands défis et débats relatifs aux institutions d’enseignement supérieur à Bruxelles. 3.5. How can Brussels really become the biggest student city in the country? 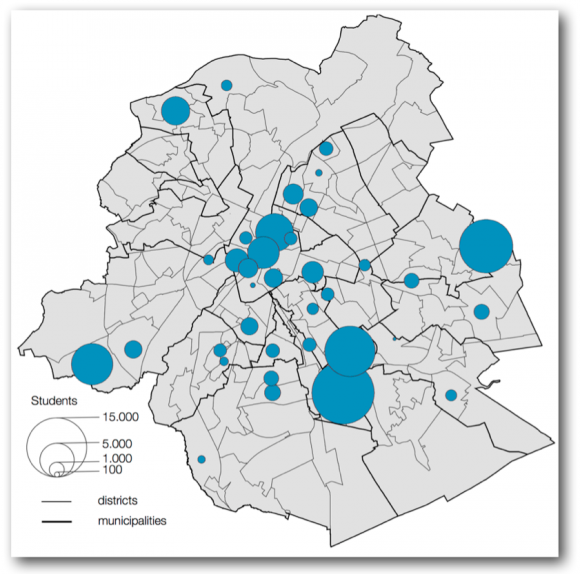 1In the 21st century, higher education and major cities are inextricably linked. In contrast to rural areas and smaller towns, large cities such as Brussels sometimes number scores of public, semi-public, even private higher education institutions (HEIs).1 They bring tens of thousands of students and staff to the city to study or work. Despite the abundance of universities and colleges in Brussels, our knowledge of these institutions and their relationship with the city shows many gaps [Van Camp and Witmeur, 2009]. This synopsis therefore largely takes a descriptive approach: identifying, mapping and discussing the major political, economic, social and cultural relations between the Brussels HEIs and the urban environment with its numerous public, semi-public and private stakeholders. 2For the first time, these often institutionally fragmented (at various levels of government and in different public and private higher education institutions) data for Brussels have been collected in a single document and considered in a comprehensive analytical framework. The magnitude of the challenge this mapping represents cannot be emphasised enough. According to their activities, higher education institutions fall within the remit of different federal authorities (mainly the regions and the communities) and different systems (university and non-university) with specific statistical and analytical systems. The bilingual status of the Brussels Region involves harmonising data on a territorial basis, which is not always easy with respect to community data. Furthermore, not all institutions have their main seat in the Brussels Region, which makes it necessary to break down the internal institutional data in terms of territory (for example in the case of Université Catholique de Louvain – UCL, which has two campuses in Brussels). And the institutions in Brussels have activities outside the Region (for example, Université libre de Bruxelles – ULB, in Charleroi). Finally, the proximity of Leuven and Louvain-la-Neuve prompt us to pay constant attention to the scales of analysis and the metropolitan area. In this document, unless otherwise mentioned, “Brussels”, “Region” and “city-region” denote the Brussels-Capital Region (the territory of the 19 municipalities of Brussels). If another spatial definition is used, it will be specified explicitly through the use of terms such as “Brussels-City” (one of the 19 municipalities of Brussels) or “Brussels metropolitan area” (including the Brussels Region). If certain types of institution or certain institutions are excluded, this will be clearly stated as well. 3At the same time, this synopsis aims to connect – in an exploratory manner and in a research area which, for Brussels, is still wide open – with a number of ongoing debates, in particular about the contribution of HEIs to Brussels regional development, both economic and social, this extending far beyond the concept of “social service”, the traditional third pillar of the mission of Belgian universities (in addition to education and research). 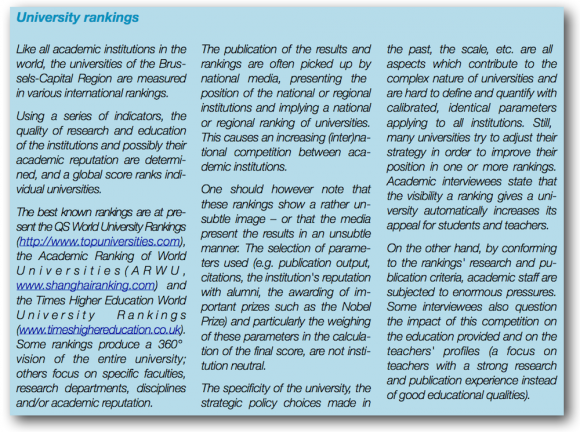 4From this perspective HEIs are considered institutions which (a) attach importance to public commitment, next to research and education; (b) explicitly take on a larger economic and social role, going beyond technology and knowledge transfer; (c) play a regional role, together with their national and global ambitions; and (d) are part of a governance and financing system that supports such activities and qualities [Goddard, 2009]. The question arises as to whether this repositioning applies to western European HEIs in general and Belgian-Brussels universities and colleges in particular. 5At least three other themes from the larger debates about the role of knowledge in urban and regional development merit more attention: the role of regional innovation systems (RIS) as regional development drivers; the Europeanisation and globalisation of higher education and research; and the position of HEIs in the so-called knowledge economy and knowledge society. 6Regarding the first issue, since the 1990s, researchers have been investigating the importance of a territorial innovation base [Iammarino, 2005; Moulaert and Sekia, 2003]. It is then generally accepted that innovation does not just happen everywhere [cf. Boschma, 2005 for the various dimensions concerned]. Spatial proximity, the small distance between higher education institutions and other stakeholders and organisations, can play an important role in a Region like the Brussels-Capital one, which is only 161 km2. But at the same time, the geographic proximity it implies, is not necessarily enough to contribute to regional development, if only because the stakeholders, organisations and institutions are sometimes locked in their traditional patterns of thinking and acting [Malmberg and Maskell, 2006]. 7The second debate concerns the globalisation and Europeanisation of higher education and research. This goes beyond the obvious international mobility of students [Cicille and Halbert, 2012: 57‑58 & 63‑64], researchers and teachers. The economic emphasis on knowledge and innovation has played a central role in the positioning of HEIs as knowledge providers to a global economy, with much attention to the interaction between HEIs and businesses. This has led to the rise of technology transfer as a core task of HEIs, together with their existing missions of education and research. The position of Brussels as a metropolis, linked with a global network of cities and regions [Taylor and Aranya, 2008; Vandermotten, 2013; Corijn and Vloeberghs, 2009], makes this debate even more relevant. Incidentally, this position is not only related to the plural functions of Brussels as a capital but also to the presence of supra-national and non-governmental organisations [Taylor, 2008: 71]. 2 Source: IBSA, Table 9.1.2.1, 2011. 9It should be noted that this R&D measure is too limited to allow us to understand the position of HEIs in a large city, if only because the wider ecosystemic approach to knowledge production and knowledge circulation is lacking. The latter theme is also linked to a new debate: should HEIs function as knowledge producers for the identification and solution of urban issues? And should they act as an interface in this context, bringing together various regional stakeholders? We take along these questions as the background of the characteristics and challenges of Brussels higher education which will be discussed here. 3 These are the individuals referred to in this synopsis as interviewed stakeholders or interviewees. 10In order to transcend the until now fragmentary nature of our knowledge of universities and colleges and gain insight into the various dimensions of the presence of HEIs in Brussels, a threefold methodological process was used. Firstly, a dashboard with more than 40 indicators was developed (using information provided by HEIs, but also public and parapublic stakeholders), providing an overview of relevant dimensions such as the number of higher education institutions and their sites, students, researchers and staff, research activities, services and internationalisation. Secondly, we intended to collect qualitative information by interviewing (based on a semi-structured questionnaire) 35 stakeholders3 from different sectors, namely 16 academics, 7 representatives of employer and civil society organisations and 12 employees with responsibilities in public or para-public institutions. For the third information flow, we used two surveys investigating different themes: student life (survey conducted by Agence de Développement Territorial ADT-ATO in collaboration with BSI and the universities ULB, VUB, USL-B and UCL in which 4 232 students participated) and the perception of the initiatives for economic and social valorisation by the academic and research staff of the various HEIs (745 respondents for ULB, VUB and USL-B). These surveys were essential, as these two aspects have been documented very little in the context of Brussels. This synopsis provides the first results, which will later be the object of more detailed reports (a dashboard and a report will soon be available on the BSI website). 11This synopsis includes three distinct parts. The first part defines the Belgian institutional and political framework of higher education institutions in Brussels. The second establishes a series of observations. The third part discusses some major challenges and debates regarding higher education institutions in Brussels. 12In 2012‑2013, 51 higher education institutions were present in the territory of the Brussels-Capital Region with at least one site for their activities. In addition to the institutions subsidised by the French Community (204) and the Flemish Community (55), there are two subsidised bilingual institutions (Ecole Royale Militaire and Faculty for Protestant Theology) and 24 international and private institutions.6 This represents almost a quarter of students in Belgium, with more than 86 000 subsidised students7 (+20% in 10 years). 13The Belgian higher education system distinguishes various types of institution, with universities, colleges and schools of arts (both the equivalent of university colleges) as the best known. Universities provide higher education in three cycles, each of which is attested by a degree. At university, the first cycle (three years) is a transition cycle leading to a bachelor’s degree. The second cycle specialises in a subject and leads to a master’s degree in one or two years, and to a doctor of medicine or veterinary medicine degree in at least three years. There are also specialised master’s degrees open only to those who already have a master’s degree. The third cycle of studies – the doctorate – leads to a research degree and includes the preparation of a doctoral thesis. Currently, universities represent half of the students in higher education in Brussels. The weight of colleges, and schools of art in the higher education offer is therefore important in Brussels. These institutions provide short course and long course higher education. Short course programmes (bachelor’s degree), which represent two-thirds of students, often lead directly to a profession. Long course programmes (master’s degree) offered by institutions often have a more applied character than at university. 15In this dynamic, in November 1834, Université libre de Belgique – later Université libre de Bruxelles (ULB) – was founded as an anticlerical reaction to the previous creation, promoted by the Belgian bishops, of the Université Catholique de Belgique in Mechelen (moving to Leuven in 1835). As some members of the Brussels liberal bourgeoisie also distrusted the state universities founded in 1816‑17 (at the time of the United Kingdom of the Netherlands) in Ghent, Liège and Leuven,9 they wanted ULB to be a ’neutral’ university, separated from church and state. 16But ULB was not the only higher education institution active in 19th century Brussels. (founded in 1858), one of the archiepiscopal colleges of the Mechelen-Brussels diocese, created A “Section de Philosophie” was created in 1858 at the Institut Saint-Louis, which had just been transferred from Mechelen to Brussels after 20 years. This section would prepare students for higher education. The institution slowly expanded, with different names, and becoming in 2013 the present Université Saint-Louis Bruxelles (USL-B). 17Later, other institutions became active in the Brussels territory. The law on university expansion of 9 April 1965 allowed the creation of so-called deconcentrated antennas, established outside the city where the institution had its main seat. In 1965, Université Catholique de Louvain bought land in Woluwe-Saint-Lambert in order to build a university hospital (although the first intake of patients of Cliniques universitaires Saint-Luc had to wait until 1976). 18Whereas the philosophical line of fracture impacted the creation of universities in Brussels soon after Belgian independence, it took longer before the linguistic divisions between French and Dutch speakers caused profound organisational changes in higher education. From the final quarter of the 19th century, these oppositions increased, although until 1930 (when the Ghent state university was founded), French remained the dominant language of the Belgian academic world. The language issue first led to small measures, gradually gaining in importance. ULB, for instance, began introducing courses in Dutch in some study branches (starting in 1891) before creating separate Dutch sections (splitting the PhD programme in law in 1935 and the bachelor programme in law in 1946). Experiments with multilingual higher education failed. The harsh language conflicts of the 1960s were reflected on several levels, including higher education. They not only led to the well-known split of Université Catholique de Louvain. In Brussels, Vrije Universiteit Brussel and Universitaire Faculteiten Sint-Aloysius (later Katholieke Universiteit Brussel) devolved from ULB and Facultés universitaires Saint-Louis (now USL-B). With the later “communitisation” of the Belgian state, both education systems were separated from that moment. 19One Brussels particularity is the part played from the 19th century by a number of local governments, which started supporting and even organising higher education. Thus, stakeholders in the Brussels city administration and Brussels schools had supported the ULB project, for instance by offering infrastructure. Additionally, (Brussels) local administrations started organising higher or advanced education. These were mainly institutions on a college level, with roots therefore dating back to the 19th century for some of them. The most visible contemporary results are Haute École Francisco Ferrer (HEFF) and Académie Royale des Beaux-Arts, governed by the City of Brussels. Other municipalities (e.g. Ixelles and Schaerbeek) also created specific institutions (offering a single or a small number of vocational programmes). As a consequence of the rescaling operation of French- and Dutch-language colleges in 1996 and the academisation of certain programmes (for instance architecture), these institutions have now been absorbed by consolidated colleges or by universities. 20A third process, which explains the particularly high number of higher education institutions in Brussels, is the internationalisation. This has not only caused an increase of the international mobility of students, researchers and teachers. The growing European and international role of Brussels [Corijn et al., 2009] has stimulated the creation of new institutions. No less than 24 international and/or private higher education institutions have then opened a campus in Brussels. In some cases, the label “Brussels – Europe” explicitly refers to the European calling of the city. The question is what impact this internationalisation of higher education first has on the transborder (philosophical, linguistic, geographical) alliances formed between universities, but also on the teaching languages. Of course, HEIs provide French- or Dutch-language education mostly to a national population, or rather a community (although the student population has become diversified). Recently, however, bilingual programmes have emerged, and even trilingual and English-language programmes. ULB and VUB collaborate under the name of “Brussels University Alliance”. With BRUFACE, (Brussels Faculty of Engineering), they offer common bilingual programmes. Since 1991, USL-B offers bilingual programmes (French/Dutch and French/English) and, since 1993, trilingual programmes (French/Dutch/English). These programmes are now being followed by 30% to 40% of the USL-B student population (with some variations according to the study branch in which the programme is applied). 21The urban integration of HEIs in Brussels involves specific challenges. Thus, the public authorities which they must deal with for their daily management are fragmented, both horizontally (at the same level of authority) and vertically (at different levels of authority) [Van Wynsberghe, 2013]. Different definitions, including “ville éclatée”, are used to describe the scope of this administrative fragmentation in Brussels [De Bruycker, 1999]. One of the causes of this fragmentation has been the creation of two types of federated entity with partly overlapping territories: the Communities (competent for matters such as education, culture, social affairs…) and the Regions (competent for the economy, mobility, labour market, etc.). The administrative fragmentation also affects higher education in Brussels. The main competency of the communities, since the 1988 state reform, is education, including higher education. This means the accredited and subsidised higher education institutions in Brussels are part of either the French Community or the Flemish Community,10 with the exception of the Royal Military School, resorting under the federal government. When we look at the number of students registered in these institutions in the territory of Brussels, we observe that 28% of them patronised an institution accredited by the Flemish Community, and 71%, an institution accredited by the French Community (the balance relates to the federal government). 22HEIs are subjected to the decrees issued by the relevant communities. The communities also ensure the basic financing of higher education institutions. They are competent for scientific research (including fundamental research) but do not act autonomously, as both the federal government and the regions are responsible for some aspects of research and innovation [Belspo, 2013]. 23Furthermore, other public authorities are involved in the functioning of universities and colleges in numerous other areas, beyond (higher) education and scientific research/innovation. For instance the federal competence for development cooperation includes international cooperation between universities. At the same time, the higher education institutions, their staff and students, are embedded in the urban environment and interact in various ways with other public or parapublic authorities. One example is mobility, involving four public transportation authorities (STIB, TEC, De Lijn, SNCB). This seemingly indirect involvement of a series of public authorities in numerous policy areas with a direct impact on the organisation and functioning of higher education institutions, their staff and students, implies many challenges. One of these is the number of stakeholders which have to be engaged for specific projects. 14 of the 19 Brussels municipalities have one or more higher education campuses in their territory. At the same time, the premises of some higher education institutions are spread over several municipalities: three municipalities for ULB, five for VUB, two for UCL. In this context, initiatives covering the entire Brussels territory are complicated to take, as in other university cities. 24The following diagram shows the division between the types of public authority and their competences for higher education (in the large sense) in Brussels. It is however extremely simplified and not exhaustive, if only because the public and semi-public institutions active within each entity are not represented (the Brussels-Capital Region alone numbers more than 20 parapublic institutions). 25This administrative fragmentation problem in Brussels requires a nuanced approach, even if the administration of any metropolis is a complex matter [Keating, 2002]. Informal processes are too often overlooked [Vaesen, 2008]. But the administrative fragmentation can not necessarily be an (insurmountable) obstacle for projects involving the cooperation of several public, para-public and private partners. Some policy makers illustrate this by referring to the development of hospitals in Brussels and the synergy with academic institutions. In 2005 for example, a framework agreement was signed by Institut Jules Bordet (co-governed by the CPAS of the City of Brussels and ULB), the CPAS of the City of Brussels, the municipal administration of the City of Brussels, ULB, IRIS and Hôpital Erasme for the transfer of Institut Bordet to the municipality of Anderlecht and its implantation next to Hôpital Erasme – ULB, in order to concentrate the various oncologic activities in a single location. This involved the cooperation of several academic, local government and regional government institutions; the transfer of the institution to a different municipality also shows that the (potential) oppositions between different Brussels municipal administrations are not by definition an insurmountable obstacle. 26In short, one can conclude that Brussels universities and colleges operate in Brussels in a complex context, characterised by a multi-scale and multi-institutional governance structure. Within this fragmented structure, HEIs confront the challenge of developing new cooperation mechanisms, harder task than in university cities with smaller and more consistent administrative territories. This situation also has repercussions for image building and perception. 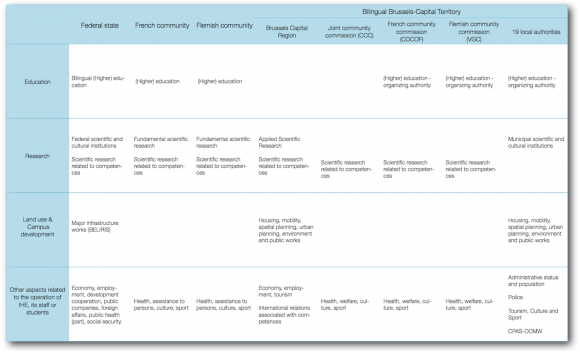 There is currently no common communication plan (for HEIs, public authorities and their private partners) branding Brussels as an urban region for research, innovation and higher education, in short as a knowledge city. 27When discussing the regional impact of universities, one can observe between various types of impact: universities usually belong to the biggest employers within a city; students and staff not only study and work but, for some of them, also live and spend their income in the city on consumption goods and housing; universities attract and train highly educated people, thus contributing human capital to the local labour market; and universities purchase a variety of goods and services, a part of which will be local. Additionally, universities engage in a variety of entrepreneurial initiatives which also create local economic effects, such as science parks, incubators and spinoffs, patenting, consultancy work and, more generally, the commercial valorisation/exploitation of research. 28With more than 86 000 financed student11, the Brussels-Capital Region is the main student city in the country, far ahead of Ghent (63 000 students), Leuven (40 000), Antwerp (38 000) and Louvain-la-Neuve (23 000). 29Economic, management and legal science account for almost 29% of students registered. Social and political science with communication account for a total of 15%. In all of the HEIs in Brussels, the health-related programmes (medical, paramedical and pharmaceutical science, etc.) account for almost 18% of students registered. Programmes with a strong creative component (arts, architecture, etc.) are also very popular (9%). Programmes related to the international function of Brussels (translation, languages, etc.) account for approximately 5% of students registered. Scientific or technical programmes in the strict sense (science, engineering, etc.) represent 11% of students registered. Young students in Brussels therefore have very different pathways, with a marked dominance of the humanities in the broad sense, which have absorbed most of the increase in student numbers due to widened access to higher education since the 1960s. The weight of health-related programmes is mainly associated with three teaching hospital campuses located in the territory of the Region. The significance of creative programmes is explained by the presence of many art colleges and three schools of architecture. 30Students at institutions in Brussels are above all female. Young women represent 57% of students registered. This confirms a more global observation for Brussels, namely the increase in the number of female students since 1970 and the stabilisation in their numbers since 2000 [Droesbeke et al., 2001; Van Campenhoudt et al., 2008; Vermandele et al., 2010]. This underlines the fact that the democratisation of higher education has taken place mainly through young women [Alaluf et al., 2003; Vermandele et al., 2010]. However, the average rate of feminisation conceals major differences according to programme [Vermandele et al., 2010]. 31The question of the democratisation of access to higher education raises that of the socioeconomic condition of students, for which we have little globalised data which is comparable at regional level [Observatoire de la santé et du social, 2013b]. However, almost 20% of students in Brussels receive grants (this proportion is similar in the Flemish HEIs). The HEIs themselves also offer financial support through their social services. In 2011, the CPAS in Brussels granted social integration revenue to more than 2 900 students aged 18 to 24 [Defeyt, 2012]. Half of this aid was granted to students in higher education. The high number of students who receive “general” social assistance underlines the deficiencies in the system of grants in Belgium, which is a competence of the communities, and in particular their limitation to costs which are directly related to studies [De Wilde et al., 2011]. 32Internationalisation is another dimension of the diversity in the types of public. In 2011, almost 23% of students were not Belgian and 7% were not EU nationals. This does not necessarily mean that they all come from abroad: Brussels is an international city, and 33% of its inhabitants are not Belgian, yet their children may live and study in Brussels. There are a large number of French students in the medical and paramedical programmes, especially in the French-language institutions, which recently led to a process to regulate registration. In the framework of Erasmus exchange programmes, there are almost 900 students who attend ULB, VUB and USL-B temporarily (entering in 2011‑2012), and there are more who attend the other institutions as well (figures not available). Yet, like most Belgian university cities, Brussels is clearly attractive, as less than 700 of these students have left these three institutions. 33In average-sized university cities such as Leuven or Louvain-la-Neuve, the presence of students is very visible. In a big city such as Brussels, their presence tends to become diluted, despite their numbers. 34Firstly, this is explained by the many other urban functions, which decrease the relative weight of higher education institutions. In the Brussels Region, there are almost 14.6 inhabitants per student, compared with 4.0 in Ghent and 2.5 in Leuven. 35Secondly, the location of institutions in the Brussels Region is multipolar and makes use of different methods of insertion into the built-up area. The model of the campus as a vast private space accessible to the public, with auditoriums, offices, libraries, laboratories, housing and sports and leisure facilities intended essentially for the university community, is characteristic of Solbosch and La Plaine, and to a certain extent, CERIA in Anderlecht, where French- and Dutch-language colleges are located (not to mention secondary education institutions). Designed to be functional, campuses contain heritage features which are often interesting, even though the increased popularity of higher education and the associated needs in terms of real estate have often damaged the quality of the architecture [Unger et al., 2004]. However, they are often isolated from the surrounding urban fabric. As places of study and work, they are rarely considered as places for living, and do not necessarily function as true semi-public spaces. The teaching hospital campuses in Anderlecht, Jette and Woluwe, which are even more out of the way in the regional space, are also relatively shut off from their immediate surroundings, even if their medical function opens them more to contact with the population. None of these campuses are true regional or local focal points, all the more since they are located near municipal or regional limits, which does not help to integrate them into an overall urbanistic vision. While campuses are places of study for a majority of students in Brussels (approximately 60%), higher education institutions – especially colleges as well as Université Saint-Louis - Bruxelles – use buildings within the dense urban fabric, which of course does not contribute to their visibility. These more central locations result in an even less visible student presence than the campuses on the outskirts. 12 Source: BSI calculations according to BELDAM, 2012. 36A third factor is related to the place of residence. The Brussels Region is the place of residence of 37% of students registered in higher education in Brussels, which tends to dilute them in the general population by greatly reducing the need to leave the parental home. Part of the 27% of students who live in Walloon or Flemish Brabant are probably in the same situation and make the commute. Thankfully for mobility in Brussels, more than 8 out of 10 students use public transport12, walk or cycle to their classes. The accessibility of most of the higher education sites by public transport plays a major role, even if the improvement of the STIB service is a true challenge for campuses such as Solbosch and VUB university hospital in Jette, as is accessibility by rail of the main VUB campus via Etterbeek Station. 37Approximately 60% of university students do not live with their parents during the week (the “koteurs”). The vast majority of students who live with their parents during the week are those whose parental home is located near the universities, or who have easy access to university from their parental home. It has also been observed that as the level of education rises (and correlatively age), the percentage of students who have left their parental home is greater: at bachelor”s level, they represent between 44 and 57%, and between 70 and 80% of students at master’s level13. 38The housing which belongs to or is managed by higher education institutions is concentrated near large campuses (Solbosch, Plaine, Erasme, Jette and Woluwe). The private flats listed in the housing services of French-language institutions are concentrated in the southeast quadrant of the Region, especially in the outer ring. The private flats listed by the Dutch-language institutions are concentrated in the “Pentagon” area as well as in Koekelberg and Schaerbeek, in direct connection with the institutions’ sites. The “Quartier Latin” of Dutch-speaking students is therefore in the “Pentagon” area, and that of French-speaking students is in Ixelles and Saint-Gilles. 39But in any case, the number of flats in the Brussels Region is limited (approximately 10 000‑12 000, i.e. around 2% of housing). They are not always identified as such, once again contributing to reduced visibility off campus. The ADT-ATO survey also confirmed that the student housing market is not a closed market aimed only at students. “Koteurs” in the strict sense (in a university residence, small flat or a room in a house) represent only 45% of the university students interviewed who do not live with their parents. 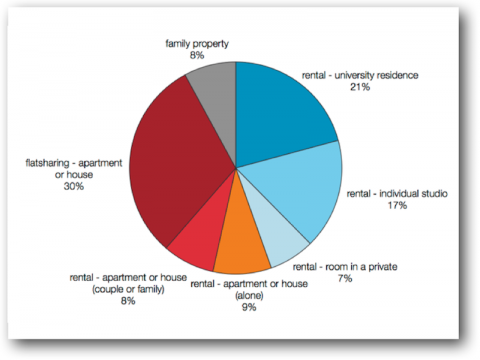 Flat-sharing in particular has led to a majority of students being in the “normal” segments of the housing market. This is another element which contributes to their relatively low visibility. 40Research, development and innovation are at the heart of the Lisbon Treaty (2000) devoted to a knowledge-based economy. In 2002 in Barcelona, European leaders assessed the effort in innovation, asking the member states to increase their expenses in the area of research and development (R&D) by 3% of their gross domestic product (GDP). The Brussels Region has a low level of investment in research and development with respect to European objectives, the European average, other regions in Belgium and even certain European capital regions. In 2011, this percentage reached 1.4% of the GDP for the Brussels Region compared with slightly more than 2.4% in Flanders and 2.5% in Wallonia. In Brussels, this under-investment is linked mainly to the low level of R&D expenses in the private sector, which represent only 50% of investments, compared with 57% in Flanders and 75% in Wallonia [Clerbois et al., 2013]. The private under-investment is mainly due to the relative weakness of the industrial fabric of high or medium-high technology, which is understandable given the cramped and urbanised character of the Brussels territory and its status of international city with a strong link to administrative functions [Innovative Brussels, 2013]. A large part of the pharmaceutical industry in the metropolitan area is located in Walloon Brabant, for example. Finally, as private R&D expenses are often made by big industrial companies [Vincent, 2009], the limited decision-making power in the economic sphere of Brussels and the decline of Belgian capitalism to the benefit of transnational companies also play a role. As R&D is a strategic sector, it is often associated with company head offices, which are seen less and less in Belgium [Vandermotten et al., 2009]. 14 Source: IBSA, Table 9.1.2.1 & 9.1.2.2, 2011. 41Both the lack of private investment and the density of higher education institutions have resulted in the fact that, in the Brussels Region, the majority (59%) of the 15 288 workers (64% of researchers) in the R&D sector work in the academic sector.14 The colleges are not totally absent in this niche (especially those which offer master’s degrees in technological fields), but their method of financing and operating procedures mean that their contribution remains marginal [ADISIF, 2013]. Most of these researchers therefore work at universities. 15 Source: CREF & VLIR statistical directories, 2011. 42Not counting the Brussels locations of UCL and KUL, hospital staff or technical and administrative staff appointed to research, there are more than 4 000 full-time equivalent researchers at universities in Brussels.15 A large proportion (approximately 70%) of these researchers work in a perspective of basic research, i.e. on academic research, with subjects chosen relatively freely or with research agendas which are not compelled by a logic of short-term valorisation. Researchers are essentially financed by the operating allowances of universities (via the research costs of professors and the doctorates of assistants), the major community research funds (e.g. FNRS & FWO) and European research funds (e.g. grants from the European Research Council). This research contributes largely to the many doctoral theses (369 doctoral theses defended in 2011 in Brussels, including UCL‑Woluwe). 43In an international frame of reference, publication output is considered as an important measure of scientific excellence of institutions and/or regions. Based on the Thomson Reuters Web of Science Core Collection database, this BSI study performed an analysis of the global publication output of the Brussels knowledge institutions (Brussels-Capital Region) in the period 2008‑2012. The total number shows that Brussels scores particularly high as a knowledge region: the publication activity per 10 000 inhabitants is considerably higher in Brussels than in Flanders and Belgium and, compared to the known data from the SCOPUS database, also materially higher than the EU-28 average. 44This makes the Brussels-Capital Region a knowledge region in the heart of Europe. 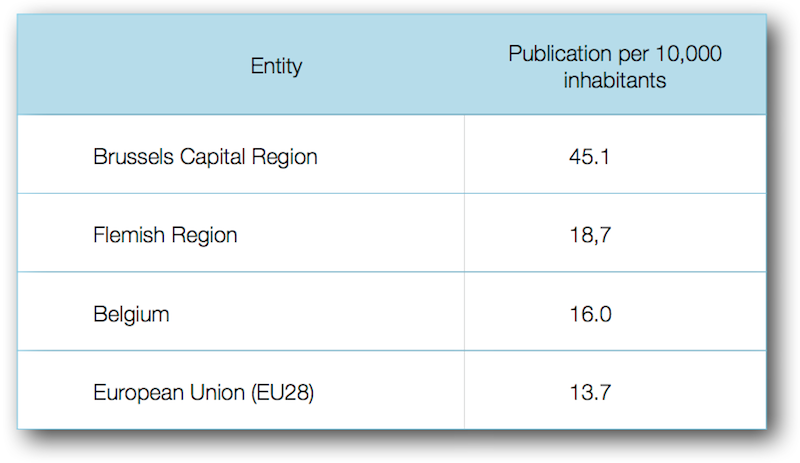 Some 70% of the publications in the Brussels-Capital Region are realised by HEIs, the remaining 30% by non-HEI public institutions and organisations and enterprises in the economic and industrial sectors. Only a small fraction are co-publications between both groups. Clinical research, physics and engineering score highest in terms of HEI publications. In other institutions and organisations, publication rates are highest in geosciences and biology; this obviously shows the importance of public research institutions. The publication activity also illustrates that Brussels HEIs have a high degree of international cooperation with institutions in more than 150 different countries. In terms of intensity, France is the preferential partner, in a top ten including eight European nations (the remaining two being Canada and the United States). The intensity of cooperation and the selection of international partners are largely similar for most disciplines, with the exception of humanities and social sciences, where The Netherlands ranks first in the number of co-publications. 45European funding is becoming increasingly important in the financing of research. Given the level at which calls are issued and their competitive character, participation is also a means of measuring the academic competitiveness of universities [Cicille and Halbert, 2012, pp. 55‑57 & 59‑62]. The EU Framework Programme (FP) is by far the most important European intervention for research and technological development. For example, the Seventh Framework Programme (FP7) of the European Union for technological research and development finances a series of actions. Its objective is to contribute to building a European Research Area (ERA) in a perspective of excellence. In the FP7, 29% of the budget allocated to Belgium has been assigned to institutions located in Brussels. The Brussels-Capital Region benefits from the fact that it is where the main seats are located for many institutions and international research coordination organisations which receive a large share of this budget. The “Belgian” (strictly speaking) stakeholders in Brussels obtain 15%. With 233 projects, the universities, university hospitals and colleges are the most active stakeholders in terms of the number of projects [Van Loon and Laurent, 2013]. 46Research may also be more applied, in particular by targeting very specific areas of investigation defined by the subsidising authorities, often in connection with their areas of competence, and even by answering specific questions in a decision-support approach. The analysis of sources of research financing in the three universities with their main seat in Brussels shows that some researchers who benefit from exterior funds have received financing in the framework of programmes whose themes are defined by the sponsor. It should be noted however that 30% of researchers who are financed in this targeted framework generally have considerable freedom in their approach and methodological choices. Even in the case of work conducted in response to a precise question, the call for university researchers is often issued to benefit from their experience in order to deal with complex problems and develop new methodologies, and even to ensure a certain image of independence with respect to the results. This relative independence is real at financial level, in as much as the financing for consultancy services in the strict sense represents a limited share of research funding, in particular as regards funding from the private sector. 16 Source: SPF Santé publique, BSI calculations, 2012. 47The health sector in Brussels is a good example of the integration of the different missions of HEIs: teaching, research and services to the community. Three university hospitals and three general hospitals with an academic character are active in the regional territory. The specificity of university hospitals is their teaching and scientific research function, in addition to their healthcare function. They depend on a university with a faculty of medicine [RUZB-CHAB, 2007]. Hospitals with an academic character have specific collaboration agreements with university hospitals for the training of healthcare professionals and for specialised care. Together they represent 4 200 beds, i.e. 52.3% of beds in the Brussels Region and 7.8% of those available in Belgium. They therefore treat approximately 61% of hospitalised patients in Brussels16. With 12 018 staff (2012), they are a major employer. 48We have already underlined the weight of the medical programmes in terms of registration (18%, i.e. more than 15 000 students), both at university (medicine, biomedical science, etc.) and colleges (nurses, nurses’ aides, etc.). Through work experience placements and internships, hospitals are an ideal place for implementing what has been taught. But the presence of students also contributes to the smooth daily functioning of these institutions. Beyond the medical professions, this sector also provides opportunities for work experience placements in other areas such as administrative or technical management. It should be noted that the only specialised training in medical electronics in the French Community is in Brussels. 49With their staff and specific infrastructures, university hospitals in Brussels largely meet the needs of clinical research. It is often conducted with the support of public authorities, in partnership with the pharmaceutical industry, which has a strong presence at metropolitan level. The Brussels-Capital Region implemented “ClinicoBRU” in 2012, which is a joint sectoral platform for the three university hospitals in Brussels. In 2013, 200 projects sponsored within this framework were initiated, involving 750 researchers and nurses as well as 2 000 patients. Some of the spin-offs of universities in Brussels are also active in the medical sector in the broad sense. 50Apart from their activity in the area of education and research, university hospitals ensure a dominant role in the healthcare system by providing care and treatments. These institutions also treat highly specific pathologies (multiple traumas, cancer research, etc. ), which means that their reach extends well beyond the regional framework: 55% of patients hospitalised in a university hospital in Brussels are residents of Brussels, 23% come from Flanders, 20% from Wallonia and 2% are residents of a foreign country. 51This strong integration of the three missions of universities and the close collaboration with colleges are fairly specific to the health sector. This is of course made easier by the fact that in this case, university institutions are operators of the entire stream, bringing together funding from various origins (community funding for education, community and regional funding for research, and federal funding for social security and healthcare) for their hospitals. The latter are nonetheless subject to the financing difficulties connected with each level of authority and represent a burden on the budget, which is of great concern to the universities. 52The other types of service provided to society by university institutions are much less structured and integrated. We may however mention university certificates (continuing education) and the research about Brussels. That research is stimulated by the creation of internal university networks and the interuniversity platform called Brussels Studies Institute (also see point 3.1. hereunder). We may also underline the significance of tutoring programmes (approximately 7% of students registered) in the Brussels context (demographic growth, as well as a high rate of academic failure). Initiatives aimed at supporting students experiencing difficulties in their studies exist mainly at ULB (Schola) and VUB/EHB (BRUTUS). Tutoring is organised for secondary schools (and more recently for primary schools by ULB) in the Region. Students are paid to give free lessons to children. The aim of these projects is simple: contribute to success at school, increase the chances of obtaining a diploma and, ultimately, allow access to higher education [Chaltin and Janssens, 2013]. 53Universities and colleges are important economic stakeholders, if only through the magnitude of their spending. In 2012, the combined income of just the four large universities accredited by the French and Flemish Communities which are presently active in Brussels (ULB, VUB, USL-B and UCL, HUB is not included due to a lack of comparable data), amounted to some 617 million euros (the equivalent of 23% of the Brussels-Capital Region’s budget). Only 9% of this income resulted from registration fees paid by students (registration fees vary between both education systems: at the French-language institutions they are 835 euros, at the Dutch-language institutions, 619 euros). In that year, some 265 million euros were spent on various services and goods (operating costs), such as hotel and restaurant expenses, office supplies, travel and lodging expenses, etc. (ULB for example spent more than half of the amount in Brussels). Further segmentations of expenditures are difficult to define, as the university budgets do not compare easily. 54The financial capabilities of subsidised higher education institutions in Brussels are also determined by the finance mechanism applied by the relevant authorities. Obviously the French and Flemish Communities, being competent for higher education, play a major role. They provided 56% of the income of the four aforementioned Brussels universities in 2012. Both communities use so-called “closed envelope” financing, causing internal competition between the institutions (one institution’s gain is the other’s loss). But there are strong differences between the budgetary capacities of both communities. The following table shows the evolution of government expenditure (corrected for inflation) per student in higher education in the French and the Flemish Communities, with 2002 as the year of reference. For both entities, the index rate fluctuates, but the global evolution is positive for the Flemish Community and negative for the (global) French Community. In any case, both communities are, however, tackling the issue of the underfinancing of higher education. 55As employers, in 2011, universities and colleges employed more than 16 000 people. If we include the people who work in university hospitals, the total amounts to more than 28 000 people, i.e. 4.5% of employment in the Brussels-Capital Region. To this we must add student jobs. The ADT-ATO survey indicates that 33% of university students interviewed are employed during their studies. Most of them (63% of the 33%) work throughout the year and 67% of the jobs are located in the Brussels Region. 56Among the staff in higher education institutions, approximately 46% live in Brussels. This is similar to the percentage for all workers in Brussels. However, considering the level of qualification of the staff and the location of big campuses on the outskirts of the city, the establishment in Brussels of the sector’s workers is slightly more pronounced than with other sectors of activity whose staff have the same level of qualification. This of course has an impact on tax revenue in the Brussels Region. 57HEIs also play an important part as economic stakeholders through the marketing and commercialisation of their research, reflected in various forms of contract research, patent management, the procurement of income from licensing and the development of spin-off initiatives. Looking at the total sources, based on data from the research departments of three universities (ULB, VUB and USL-B), we observe that 20 million euros are being generated by those specific contracts. This does not take into account the services provided in the aforementioned university hospitals. We also see that the three universities own a total of 50 active spin-offs and 4 incubators, which is an important stimulus for the capacity for innovation of the Brussels-Capital Region and for attracting high-tech business to Brussels. 58The multiple fragmentations in higher education mentioned above, but also the internal academic fragmentation (in disciplinary faculties and professional specialities) exert a clear influence on the production and possible use of knowledge in the urban region. 59Which knowledge flows exist in the Brussels urban region and what are the positions of the various stakeholders towards them? At present, we can only conclude that we have a very partial and often anecdotic view of the role of knowledge institutions in Brussels and of the use made of the knowledge produced (or not produced) by HEIs. It is, however, obvious that in the recent past numerous initiatives have been taken, in order to, among other purposes, (partly) compensate for the fragmentation of knowledge. As such, Brussels, 2000 “European Capital of Culture”, may be considered as a starting point for more active and structured participation of academic stakeholders in the city [Corijn and De Lannoy, 2000]. Many initiatives and reflections emerged with respect to the future of Brussels involving academics, notably the Citizens’ Forum of Brussels in 2008‑09 [Nassaux, 2011; s.n., 2010]. This has resulted in other projects, including the foundation of the Brussels Studies Institute, involving cooperation across the many barriers (disciplinary, philosophical and communitary). 60In Dutch-language higher education, in recent decades, various fusion operations have been achieved. In the great operation of 1995‑1996, 17 institutions were then absorbed in the Erasmushogeschool Brussel (EHB). The Dutch-language Catholic institutions entered a similar phased and still ongoing consolidation: 11 institutions have formed EHSAL (itself founded in 1925), while 14 institutions fused in St. Lukas and Luca School of Arts. The first institution, which includes the Katholieke Hogeschool Brussel (itself a conglomerate of 3 institutions) and the IRIS Hogeschool Brussel (2002), joined HONIM and VLEKHO in 2007 and formed the base of Hogeschool-Universiteit Brussel (HUB), which since 2013 is linked to KAHO St. Lieven (Ghent) under the (provisional) name of HUB-KAHO. 61From 2002‑2003 onwards, the creation of these so-called “associations” also institutionalised partnerships between universities and colleges within the Flemish Community on the basis of traditional philosophical affinities. The option of a similar association process of HEIs on a Brussels territorial scale was not taken. As a consequence, the Dutch-language system (financed by the Flemish Community) now has two associations in the Brussels territory: Universitaire Associatie Brussel, comprising Vrije Universiteit Brussel and Erasmushogeschool, and Associatie KU Leuven, of which HUB-KAHO and LUCA School of Arts form part. 62In the French-language system, the restructuring of the higher education landscape in connection with minister Marcourt’s reform (2013) reinforces the integration of university, colleges and art colleges in a system of joint management and coordination on the scale of the Fédération Wallonie-Bruxelles: Académie d’Enseignement Supérieur et de Recherche (ARES). But above all, this reform goes beyond the typical historical and philosophical split [see Molitor, 2010] by imposing local coordination poles on a geographical basis. This involves organising and optimising the sharing of community infrastructures and services at local level. Brussels-Capital Region is one of these poles. It is the only one which is organised around two university institutions (ULB and USL-B) and where the philosophical perspective is transcended not only at the level of colleges, but also at university level. However, the concern not to isolate UCL, which has campuses but not its main seat in Brussels, has caused the geographical poles to lose some of their authority to ARES in the course of negotiations, or to one of the three “interpolar” academic areas (Brussels-Walloon Brabant) with competence as regards tutoring and opinions on new accreditation in short course higher education. A form of global coordination is emerging in Brussels for French-language higher education. All that remains is for it to function and to coordinate it with the other community, which operates in a perspective of philosophical alliance and therefore does not act as a direct counterpart. The Brussels University Alliance (BUA), associating ULB and VUB, is an intercommunitary opportunity going in the same way. 63A higher education diploma and the training associated with it represent an important contribution to the cultural capital of individuals (according to Pierre Bourdieu) and to the human capital of societies (according to Theodore Schultz and Gary Becker). For an individual, a higher education diploma is beneficial at socioeconomic level (higher wages, lower unemployment) as well as in terms of self-fulfilment (better quality employment, satisfaction with respect to one’s duties, state of health, interpersonal networks, social mobility, etc.). In a more strictly economic approach, the calculation of costs (expenses related to studies and a later start in the job market) and benefits (higher salary and associated tax revenue) at individual and collective level allow the return on investment generated by higher education to be established. Even if the calculation methods and the elements to be considered (effects on the competitiveness of companies, indirect benefits related to better health, etc.) are a matter of debate, it is clear that the investment is profitable at individual level as well as for society [Demeuse et al., 2013; OECD, 2012 & 2013; Groenez et al., 2010]. 64The social benefit is usually calculated in a state framework whereby many different regulations and transfers are ensured and/or arbitrated by the state. However, in an increasingly advanced federal context, social interest does not necessarily translate into a direct regional interest. In other words, in the Belgian institutional framework, the positive effects of higher levels of training do not automatically benefit the federated entities which finance it or the populations of the regions where these institutions are located. This of course is not a minor detail in the case of Brussels-Capital Region. The extent of the benefit at local level depends on many factors: recruitment of institutions, differentiation of educational pathways, transition to employment on completion of studies and residential establishment processes. 17 DGSIE, survey regarding workforces. 65The differences in the participation and success of students according to social background are still very significant. In Belgium, 70% of people aged 25‑34 have a higher education diploma in cases where their parents also have a higher education diploma. The percentage is 44% if their parents have an upper secondary diploma, and 20% if their parents only have a lower secondary diploma [OECD, 2012: 119‑122]. The Brussels Region is characterised by a significant proportion of higher education and university degrees (35% in 201217) as well as by a small proportion of upper secondary diplomas [Roesems et al., 2006: 83‑90]. If we consider only the young generations, the proportion of people with a low level of education (at most a lower secondary diploma) has decreased less in Brussels than in the country as a whole. The concentration of more disadvantaged populations, whose parents have a low level of education, partly accounts for this situation. 66A significant proportion of young people in the Brussels Region (57% of people aged 25‑29) are not able to benefit from higher education, first of all because they do not have access to it. One out of five young people in Brussels leave secondary education without a diploma giving them access to higher education. These proportions are much higher than in other Regions [Observatoire de la Santé et du Social, 2013a & b]. Secondly, the level of participation in higher education is lower among people with a socially disadvantaged background, even among those with an adequate diploma. Students from a disadvantaged background also tend to prefer short course higher education, thus suggesting self-selection processes based in particular on the level of studies of parents and more broadly on young people’s social background [Van Campenhoudt and Maroy, 2010; Dupriez et al., 2009]. Finally, in the course of higher education studies, social background continues to have a significant impact on success rates [Dupriez et al., 2009; Vermandele et al., 2012]. 67Higher education institutions are of course not directly responsible for the many processes which lead to educational segregation in compulsory education [Wayens et al., 2013]. They are nonetheless major stakeholders in the training of compulsory education teachers (teaching diplomas and education departments) as well as in the management of education systems through their research activities. Their students may also be mobilised in the fight against academic failure in the framework of tutoring programmes. The investment of higher education institutions in educational streams and more generally in all areas related to compulsory education may therefore result in significant societal benefits, in particular in Brussels where the extent of failure at compulsory education level is a major obstacle to access to higher education. 68A more direct contribution of higher education institutions to the development of human capital in the Brussels Region is related to their capacity to increase their penetration and graduation rates in Brussels. This involves increasing the participation and success rate18 of students from a socially disadvantaged background. The diversity (colleges and universities, programmes) as well as the density and proximity of higher education institutions in Brussels are assets from this point of view, as the effect of distance is less noticeable. Distance is more likely to lower university participation rates among young people whose parents have a low level of education than among those whose parents have a university degree [Unger, 2005]. Apart from the cost involved in studying far from home, it appears that in families with low cultural capital, moving away from home is unlikely due to a lack of precedents and familiarity with higher education [Grignon, 2000]. But taking advantage of this relative proximity of disadvantaged populations involves a drastic increase in success rates, in particular at the beginning of degree courses, without lowering standards. This requires a true investment, going far beyond the insufficient means to promote success. This of course represents an expense for higher education institutions and cannot be considered without specific means of financing [Demeuse et al., 2013]. More broadly, this requires making room for a higher number of young inhabitants of Brussels in higher education institutions. 19 It has actually been increasing in Flanders, but reducing in Brussels and Wallonia. 69A major problem in higher education is that the number of students is increasing more rapidly than the amount of financing. The decrease in financial means per student (especially in the French-language system) involves a reduction in the amount of support. This penalises the most disadvantaged students from more humble sociocultural backgrounds. Without more favourable budgetary perspectives, there may even be renewed interest in entrance exams, reinforcing social selection. Belgium has had the same rate of access to higher education since 200019 (it has increased in most countries in the European Union). Furthermore, the decrease in the amount of support reduces the time devoted to research and leads to a deterioration in working conditions [Lambert, 2013]. 70The issue of greater access and success is all the more important for Brussels since its economic structure and the employment offers are more and more adapted to workers with a higher education or university degree [Vandermotten et al., 2009]. More perniciously, in periods of high unemployment, students with a higher education diploma – although they are affected less – [Observatoire bruxellois de l’Emploi, 2013] work at more and more jobs for which they are overqualified due to a spate of de-skilling processes [Devillé, 2008]. This tends to reinforce their competitive advantage with respect to less qualified people, at least in the private sector where the salary scales related to diplomas have less of an influence on recruitment practices than in the public sector. With respect to deskilling processes, the individual benefit of having a diploma contradicts with the collective interest by increasing the structural unemployment of less qualified workers, but also tends to limit the individual benefit in terms of salary. 71Beyond the improvement of skills of the existing population in an endogenous perspective, higher education institutions may also contribute to social capital in an exogenous perspective, through the extra-regional and international recruitment of students. Young graduates may settle in the city, where they have made ties in the course of their studies. This potential is worthwhile in the context of reinforcing the national and international position of Brussels. However, as regards financing through taxation based on place of residence, the metropolitan area benefits from this process more than the Brussels Region itself. The level of qualification tends to lengthen the distance between home and work [Verhetsel et al., 2009; Marissal et al., 2006] and to increase the probability of moving to the outskirts in the framework of residential migrations [Wayens et al., 2009], even if staff in international institutions with identical qualifications contribute slightly less to urban sprawl [Vandermotten et al., 2007]. 72As already mentioned in the introduction, in the previous decades the internationalisation of higher education in Brussels has been reflected in the mobility of students, researchers and teachers. The European Union has taken measures in order to allow, stimulate and facilitate such migration movements. This is indubitably an explicit policy goal in the European context, with the Bologna Declaration [Eurydice, 2012] stating the integration of HEIs as its main objective. Since 1987, the Erasmus Programme has been promoting international (European) student mobility. And finally, research also operates in a European and global dynamic. The EU is actively promoting the European Research Area (ERA), in particular through the Framework Programmes (FP, now Horizon 2020). These programmes mainly aim to stimulate transnational R&D projects, together with researcher mobility and other initiatives contributing to the transcending of national borders in research [European Commission, 2014]. 73Many stakeholders interviewed for this objective indicate the influence of these globalisation and Europeanisation processes on higher education policy and on the research and educational activities initiated or supported by universities. The impact of this twin process is so strong that it is described as existential, as the very competitive international environment also affects the academic work itself, if only through a gradual shift towards education in the English language and programmes aimed at international students. The growing impact of the international student population in Brussels affects not only the higher education provided and the language policies involved. It also implies concrete challenges for a large number of public and semi-public stakeholders. Several interviewees refer to the need for closer cooperation with the municipal governments, which are responsible for the registration of international students. The same goes for the housing of international students and the accessibility of campuses. In other words, the degree of attraction of Brussels for international students also has repercussions in areas transcending the strict framework of higher education. 74Apart from the issue of the reception of international students (and researchers/teachers), the interviewees indicate potential areas of tension in the trade-off between international student mobility and the accessibility of higher education for Brussels students. In this perspective, they warn of a potential risk that strategic considerations could incite universities to focus solely on attracting international students, (partly) losing their local or regional implantation. This issue could be even more relevant for Brussels, where the challenges of primary and secondary education (drop out, segregation, school well-being, etc.) are daunting. 75Another clearly visible example is to be found in the research area, where the pressure to publish (in international, highly regarded journals) competes with the available financing sources. A potential opposition raises between the striving for excellence with a clear international focus on the one hand and the provision of services to Brussels society on the other. 76Valorisation is a wide notion, used only in a restricted number of countries in an education and research policy context. Its definition then lacks uniformity and is even divergent. Essentially, any form of knowledge transfer – including education and academic publication – is a form of valorisation, but in practice the notion is generally used to indicate processes and activities in which researchers (or other stakeholders) try to “translate” their research (results) or to have them “applied” outside the strictly educational or academic context. We can distinguish two types of valorisation: on the one hand, commercial, economic or financial valorisation, and on the other, social or societal valorisation. Valorisation is a fundamental part of the various missions HEIs undertake or are entrusted with. It is situated on the sectional plane of research and service (the third mission of universities). 77The way in which HEIs build and interpret valorisation strategies depends on a number of factors, such as the policy framework and the general finance mechanism of the ecosystem in which HEIs operate, the availability of specific adapted finance instruments, the regional context, the social-institutional environment and the specific strategic policy choices of the institution. This obviously also applies to HEIs in Brussels, taking into account the fact that the communitisation of the education and science policy has caused separate finance mechanisms and instruments to be applied and/or developed. 78Still, from a general perspective, one could state that the entire repertory of financing instruments is indeed adapted to forms of economic, financial and/or commercial valorisation, but not or only very slightly to social valorisation. Furthermore the financial ecosystem is such that it does not offer institutions or individual researchers incentives stimulating initiatives in the area of social valorisation. An analysis of the valorisation of social sciences and humanities at Flemish universities, commissioned by the Vlaamse Raad voor Wetenschap en Innovatie (Flemish Science and Innovation Council) [Gijselinckx and Steenssens, 2011], suggested that researchers are not opposed a priori to valorisation, but in most cases do not wish to make efforts for the development of valorisation trajectories, because of the lack of time and positive evaluation (in terms of financial and career perspectives) for such initiatives. Our large scale survey with Brussels academics confirms this observation for Brussels. 79This is an important conclusion for Brussels HEIs. It raises the question as to how – given their embedding in the metropolitan region – HEIs can and want to design social and economic valorisation trajectories specifically aimed at the social and economic needs of the region. This will only be made possible by suitable financing mechanisms and instruments, and by recognising valorisation as a genuine standalone activity for individual researchers. 80The statements of various interviewees confirm these observations. The lack of time confronting academics and the scarcity of incentives (in terms of both financing opportunities and career perspectives) are once again cited as important obstacles. Concerning the present valorisation of scientific research and technological innovation, the stakeholders mention some initiatives in mainly the economic domain (such as the financing of technological transfer organisations in universities and colleges). The negative comments can be mainly divided into two large clusters. Firstly, the interviewees consider the links between academic stakeholders and the Brussels business community to be weak and unstructured. This valorisation mechanism is also strongly oriented towards technological and applied scientific research, whereas Brussels has primarily a tertiary economy. This Brussels economy numbers many small and medium sized enterprises for which collaboration on research and innovation with academic stakeholders is not obvious. It takes a larger effort to gain their commitment. Secondly, there is a wide consensus among the interviewed stakeholders on the need to enlarge this valorisation concept and to make it attractive for social sciences and humanities. The interviewees consider this to be an area with large growth opportunities and some respondents even call it a virgin territory. In any case, the existing potential is strongly underused. Specific suggestions concern the support and promotion of research on social challenges (without an evident economic finality or measurable output). This raises the question of the use of the knowledge acquired and its integration in a comprehensive urban knowledge system. Anyhow, both in national and international studies, a traditional one-sided knowledge transfer from HEIs to society is considered obsolete and more interactive forms of exchange are sought, by implying stakeholders in the research and valorisation trajectories and even giving them an active, co-creative role [Gijselinckx and Steenssens, 2011]. 81Higher education institutions leave a clear physical “footprint” in the city in the form of university buildings and campuses, student housing, spaces for culture and leisure, and infrastructural and mobility networks. This built environment needs to be built, managed, regulated and maintained, and thus becomes an object of attention both for university managers, government agencies and business interests. In a context of increased competition both between cities and between universities nationally and worldwide, these urban university spaces often turn into strategic development projects in which public and private partners collaborate in order to position and brand the university and city to potential investors and increasingly mobile staff and students. 82The policy of HEIs in this area is being criticised. Several interviewed stakeholders opine that the universities and colleges behave like any urban stakeholder: they act in function of their own particular interests. This refers to various aspects, such as the buying and selling of land and buildings and the role of project developers, but also to the restricted or absent interaction with the city and urban stakeholders. This is obviously an important issue: foreign cases suggest the positive contribution universities and colleges can bring to their environment through the management and development of their campuses. In this perspective the use of space by HEIs is seen as an exemplary function. In this field, Brussels HEIs have a long way to go, if only by broadening their vision of management and urban development and by evolving towards an integral vision of campus development and the need for and interaction with the environment. Several interviewees do note changes in this area and at least the growing willingness to improve. The proposed reallocation of the former barracks of the gendarmerie is therefore an urban issue, but also an issue about governance. The relationship and commitment of an institution with its urban environment remains complex however, and results from many factors: the location in the city, the nature of the environment, the layout of the campus, the size of the institution, the growth in student numbers, the ideology and management culture, and of course financial pressures. All of these elements influence the attitude of a higher education institution towards its environment. 83In this area, the student housing issue in Brussels merits special attention. Challenges exist on different levels: a quantitative shortage, no legal status (students are not always offered a “student contract”) and a lack of quality control. Many students have to enter the private housing market, competing with other inhabitants on an already small rental market. Rents are also not regulated. Interviewees think that Brussels HEIs often fail to persuade Belgian and international students to register with a Brussels institution because there is no perspective of affordable housing. It is also obvious that this situation disadvantages less wealthy students. There are also indirect consequences: as less Brussels students live in student rooms, students become less familiar with the city. This raises the questions of their future integration after their studies. 84Nevertheless, steps have been taken to remedy the student housing problems. For the students of Dutch-language higher education institutions, BR(IK was founded, building on previous initiatives and supported by the Flemish Government and the Vlaams Gemeenschap Commissie (VGC). It manages a number of student rooms but primarily issues a quality label for rooms rented by private landlords and helps students in their search for and running of a room (among others, with a model contract). In early 2014, a French-language counterpart was created: the “Plateforme Logement Etudiant”, with financial backing of the Brussels-Capital Region. Notwithstanding these initiatives, the challenges are still great and the housing issue requires a coordinated approach by the French- and Dutch-language systems. From this point of view, the regionalisation of the legislation regarding leases, which will come into effect on 1 July 2014, will enable progress in this area, in the same way as certain provisions of the new Brussels housing code. 85While the development of campuses and their integration in the city represent significant challenges, their location on the outskirts of the city contributes to “camouflaging” the status of Brussels as the biggest student city in the country. As we have seen, almost half of the students in Brussels attend higher education institutions which are not on one of these campuses, but instead are in the city centre for the most part, in particular in the “Pentagon” area. These institutions must therefore be considered as the “bridgeheads” of higher education in Brussels for the many visitors (workers, customers, tourists, etc.) who go to the city centre. But in order for the visibility of higher education in the city to be effective, a number of actions must still be taken, in the area of signage, housing (for example above shops, which could be well suited to the student population in particular), commerce (food, restaurants, laundrettes, etc. ), mobility (at night in particular) and facilities (for studying, sports, etc.). For higher education institutions, this also involves increasing efforts to become anchored and to open up to the city, in partnership with the other urban stakeholders, in particular in the cultural sphere. This involves a subtle integration in a multifunctional city, with considerable leverage possible, in particular in terms of creativity and innovation, leadership and resulting economic activities. 86This synopsis is the first attempt until now to make a global assessment of the role and importance of higher education in Brussels in its interactions with the city and urban development. 87Why has it taken so long to conduct such a study, when an abundance of academic research on various aspects of Brussels has existed for many years? The answer to this question is probably related to the fact that the “encounter” between the concerns of the Brussels regional authorities and those of higher education institutions (HEIs) is a relatively recent phenomenon, with the delay probably related to the fact that the Brussels-Capital Region (BCR) is not competent for education. In recent years, the context has changed greatly, and in light of the demographic boom, all of the regional stakeholders have gradually become aware of the scope of the challenge represented by education in Brussels, from basic education to higher education. 88This awareness has gone well beyond the framework of education in the strict sense, to include the recognition of the role of higher education as a major stakeholder in urban development (for example in the Regional Sustainable Development Plan). HEIs have also become aware of the fact that their fragmentation does not facilitate a true consideration of their role in the city, their specific difficulties and the enormous potential they represent for the BCR. The creation of the Brussels Studies Institute (BSI) – an inter-university collaboration platform for research on Brussels – is a good illustration of the new will of HEIs (and in particular Brussels universities) to speak with a single voice to the regional authorities. 89Today there are 51 HEIs in the BCR territory. Just over half (27) – representing most of the students registered – are officially recognised and financed mainly (except for two of them) by the French Community (Fédération Wallonie-Bruxelles) or by the Flemish Community (Vlaamse Overheid). But – as part of a recent phenomenon – more than 20 international and/or private HEIs have been added, which is proof of the international appeal of Brussels. 90We shall not discuss the direct or indirect causes of this fragmentation – which echo the historical evolution of Belgium – or the governance problems in Brussels resulting from the coordination of the two main education systems (Dutch-language and French-language) which function according to increasingly distinct approaches (cf. section 1 of the synopsis). Let us point out, however, that the fragmented character of the available data is related to this institutional segmentation, thus accounting for the complexity involved in writing this synopsis and the necessity of continuing this effort if we do not wish it to be an isolated attempt. 91One of the main priorities of this synopsis is simply to consolidate the figures related to the number of students who attend HEIs. In this area, very different information exists without it ever being possible to verify the data precisely. Our study shows that if we consider only the recognised (subsidised) HEIs, there are more than 86 000 students in higher education in Brussels (2010‑11 figures), which represents almost a quarter of the students in Belgium for this level of education, making Brussels by far the biggest student city in the country. 92Why is this fundamental reality so little known and so unnoticed? There may be several explanations: the abovementioned fragmentation of the higher education system, the relative proportion of these students in a city of almost 1.2 million inhabitants, multipolar locations, the scattering of HEIs in Brussels (40% of students attend Brussels institutions which are not located on one of the main campuses in the region), and the fact that the official residence of the majority of students is in Brussels (37%) or in Walloon or Flemish Brabant (27%), which tends to dilute their presence in the city (student mobility in Belgium is quite low). 93What do we know about these 86 000 students? The statistics show that their numbers have increased by 20% over the past ten years, which of course has created a major financing problem (in the French-language system, the budget has been fixed for 20 years). Furthermore, our figures show that 28% of them attend a Dutch-language institution and 72%, a French-language institution. 51% of them attend university and 49%, a college or art college. Students in Brussels are above all female (57% of students registered), even if major differences exist according to programme. 23% of them are not of Belgian nationality and 7% are not European Union nationals, which does not mean that they all come from abroad, as Brussels is an international city, with 33% of its population being of foreign nationality. In addition, a large number of students (900 for ULB, VUB and USL-B) participate in Erasmus exchange programme each year in Brussels, which is slightly higher than the number of students who leave on an exchange programme. Students in Brussels HEIs have very different pathways, with a marked dominance of the humanities in the broad sense, which have absorbed most of the increase in student numbers due to widened access to higher education since the 1960s. The significance of creative programmes (art, architecture, etc.) is explained by the presence of many art colleges and three schools of architecture. As regards the social situation of students, it must be pointed out that almost 20% of them receive grants, which is insufficient, as approximately 1 500 students are forced to turn to the CPAS for assistance. 94The proportion of students who do not live with their parents during the week (the “koteurs”) is approximately 60% for those who attend university, and probably much less for those in short-course higher education (information unavailable). But the “koteurs” in the strict sense (in a university residence, small flat or a room in a house) represent only 45% of the university students interviewed who do not live with their parents (ADT-AT0 survey figures). Flat-sharing in particular has led to a majority of students being in the “normal” segments of the housing market, where they compete with other inhabitants of the city in the search for a place to live. 95Higher education of course goes beyond the training of students and – especially at university level – is constantly irrigated by research. In this respect, it should be noted that the Brussels Region has a very low level of investment in research and development (R&D) with respect to European objectives, the European average, other regions in Belgium and even certain European capital regions. In 2011, this percentage reached 1.4% of the GDP for the Brussels Region compared with slightly more than 2.4% in Flanders and 2.5% in Wallonia. In Brussels, this under-investment is linked mainly to the low level of R&D expenses in the private sector, which represent only 50% of investments, compared with 57% in Flanders and 75% in Wallonia. The private under-investment is mainly due to the relative weakness of the industrial fabric of high or medium-high technology, which is understandable given the cramped and urbanised character of the Brussels territory and its status of international city with a strong link to administrative functions. A large part of the pharmaceutical industry in the metropolitan area is located in Walloon Brabant, for example. As private R&D expenses are often made by big industrial companies, the limited decision-making power in the economic sphere of Brussels and the decline of Belgian capitalism to the benefit of transnational companies also play a role. As R&D is a strategic sector, it is often associated with the head offices of international companies, which are seen less and less in Belgium. 96Both the lack of private investment and the density of higher education institutions have resulted in the fact that, in the Brussels Region, the majority (59%) of the 15 288 workers (64% of researchers) in the R&D sector work in the academic sector. Most of them work at universities. The colleges are not totally absent in this niche (especially those which offer master’s degrees in technological fields), but their method of financing and operating procedures mean that their contribution remains marginal. 97European funding is becoming increasingly important in the financing of research with respect to Belgian and regional funding. It is, however, interesting to note the special role of Brussels in European funding. In the Seventh Framework Programme, 29% of the budget allocated to Belgium has been assigned to institutions located in the Brussels-Capital Region. The region benefits from the fact that it is where the main seats are located for many institutions and international research coordination organisations which receive a large share of this budget. The “Belgian” (strictly speaking) stakeholders in Brussels obtain 15% of the financing for Belgium, which is significant. With 233 projects, the universities, university hospitals and colleges are the most active stakeholders. 98In terms of publications, Brussels is once again doing well. Publication activity per 10 000 inhabitants is much higher than in the rest of the country and in the EU‑28. Some 70% of the publications in the Brussels-Capital Region are realised by HEIs, the remaining 30% by public institutions and organisations and enterprises in the economic and industrial sectors. Only a small fraction are co-publications between both groups. 99Finally, the analysis of sources of research funding at ULB, VUB and USL-B shows that 30% of researchers who benefit from exterior funds have received financing in the framework of projects defined by sponsors (among whom BCR). 100The health sector in Brussels is a good example of the integration of the different missions of HEIs: teaching, research and services to the community. Three university hospitals and three general hospitals with an academic character are active in the regional territory. Together they represent 4 200 beds, i.e. 52.3% of beds in the Brussels Region and 7.8% of those in Belgium. They therefore treat approximately 61% of hospitalised patients in Brussels. With 12 018 staff (2012), they are a major employer. These institutions also treat highly specific pathologies (multiple traumas, cancer research, etc. ), which means that their reach extends well beyond the regional framework: 55% of patients hospitalised in a university hospital in Brussels are residents of Brussels, 23% come from Flanders, 20% from Wallonia and 2% are residents of a foreign country. 101While the health sector is probably one of the most visible types of service to society, many other forms are practised by HEIs, such as the Schola and Brutus programmes aimed at supporting students experiencing difficulties in their studies, and many other initiatives in the social and cultural sphere. 20 HUB is not included due to a lack of comparable data. 102Universities and colleges are also important economic stakeholders, if only through the magnitude of their spending. In 2012, the combined income of just the four large universities which are presently active in Brussels (ULB, VUB, USL-B and UCL20) amounted to some 617 million euros (the equivalent of 23% of the Brussels-Capital Region’s budget). 103In 2011, HEIs employed more than 16 000 people. If we include the people who work in university hospitals, the total amounts to more than 28 000 people, i.e. 4.5% of employment in BCR. To this we must add student jobs. The ADT-ATO survey indicates that 33% of university students interviewed are employed during their studies. Most of them (63% of the 33%) work throughout the year and 67% of the jobs are located in the Brussels Region. 104The scale of this presence is evident in several domains and directly concerns more than 115 000 people (students and workers). 105The aim of this synopsis was to review the main debates regarding the role of higher education institutions in a city-region. 106The first debate concerns knowledge production. Although universities and colleges do not have a monopoly in this area, their weight is considerable and they face a true social challenge: to create “meeting points” and “bridges” to allow the different stakeholders (who still work far too often in separate spheres) to communicate in a structural and transversal manner. This observation is all the more relevant in the fragmented context of Brussels. 107The second debate concerns the globalisation and Europeanisation of higher education. This issue is illustrated in several ways, the most visible of which for higher education institutions in Brussels is the growing internationalisation of their students, researchers and teachers. This dual process of globalisation and Europeanisation encourages, among others, policies to reinforce excellence and the development of English-language and multilingual education, in order to favour international mobility in particular. In a context in which the rate of access to university is no longer increasing in Belgium (unlike what is observed in the other OECD countries), there are tensions between the internationalisation and the democratisation of higher education (i.e. access to higher education for all young people in Brussels). The growing socioeconomic dualisation of the population of Brussels is a well-known phenomenon, which is expressed in the field of higher education. This issue is closely linked to that of the financing of higher education by the authorities concerned (and therefore to the differences between the two communities in this respect). 108Finally, the third debate is related to the role of higher education institutions in the economy and the knowledge society. In this respect, until now the attention has been almost exclusively focused on research and development and technology transfer between higher education institutions and companies. We have shown that during the past decades, a growing interest has emerged in the social valorisation of knowledge and academic expertise. In this respect, our study highlights certain sources of tension: should higher education institutions be limited to sharing “universal” knowledge or should they also allow the stakeholders in the city-region to benefit from their knowledge, and even co-produce some of this knowledge with them? 109Regarding this last point, our study shows that there have been several realisations which demonstrate the growing commitment of HEIs to the life of the region. Yet much remains to be done, in particular in the areas related to social science and the humanities. 110Our study shows that several conditions must be met in order to make better use of the huge potential of higher education institutions. First of all, there must be a political framework and a funding mechanism to stimulate this type of social valorisation. Higher education institutions themselves could also implement internal measures (a lack of time and concern for this type of activity in an academic career has often been mentioned as an inhibiting factor). Finally, public and semi-public stakeholders in Brussels also have an important role to play, in particular via a policy to provide enough financial resources to carry out valorisation activities. 111While these issues are far from being clear-cut, a conclusion is already emerging: the potential for the development of the city-region – which exists due to a high concentration of higher education institutions in Brussels – is still largely untapped. ADISIF, 2013, La Recherche dans les Hautes Ecoles de la Fédération Wallonie-Bruxelles. Premier aperçu. Brussels: Conseil Général des Hautes Ecoles. ALALUF, Mateo, IMATOUCHAN, Najat, MARAGE, Pierre, PAHAUT, Serge, SANVURA, Robertine, VALKENEERS, Ann and VANHEERSWYNGHELS, Adinda, 2003. Les filles face aux études scientifiques : réussite scolaire et inégalités d’orientation. Brussels: Editions de l’Université de Bruxelles. BOSCHMA, Ron, 2005. Proximity and innovation: a critical assessment. In: Regional studies. 2005. Vol. 39, No. 1, p. 61–74. CLERBOIS, Isabelle, ERNAELSTEEN, Christophe, DEJARDIN, Marcus and MIGNOLET, Michel, 2013. Dépenses privées et publiques de R&D en Belgique. Diagnostic en vue de l’objectif “Europe 2020”. In: CERPE. Cahiers de recherche. Série Politique Economique. 2013. No. 70, p. 1–24. CORIJN, Eric and DE LANNOY, Walter, 2000. Crossing Brussels. La qualité de la différence. De kwaliteit van het verschil. Brussels: VUB-Press. CORIJN, Eric et VLOEBERGHS, Eefje, 2009. Bruxelles ! Brussels : VUBPRESS. DAVID, Quentin, PEETERS, Didier, VAN HAMME, Gilles and VANDERMOTTEN, Christian, 2013. Is bigger better? Economic performances of European cities, 1960–2009. In: Cities. 2013. Vol. 35, p. 237–254. DE BRUYCKER, Philippe, 1999. Bruxelles et l’autonomie fiscale. In : WITTE, Els, DUMONT, Hughes, ALEN, André and ERGEC, Rusen, Het statuut van Brussel/Bruxelles et son statut. p. 122. DOTTI, Nicola Francesco, FRATESI, Ugo, LENZI, Camilla and PERCOCO, Marco, 2013. Local Labour Markets and the Interregional Mobility of Italian University Students. In: Spatial Economic Analysis. 2013. Vol. 8, No. 4, p. 443–468. DROESBEKE, Jean-Jacques, HECQUET, Ignace and WATTELAR, Christine, 2001. La population étudiante : description, évolution, perspectives. Brussels: Editions de l’Université de Bruxelles. DUMONT, Hugues and VAN DROOGHENBROECK, Sébastien, 2011. L’interdiction des sous-nationalités à Bruxelles. In: Administration Publique. 2011. Vol. 3, No. 3, p. 201–227. DUPRIEZ, Vincent, MONSEUR, Christian and VAN CAMPENHOUDT, Maud, 2009. Etudier à l’université : le poids des pairs et du capital culturel face aux aspirations d’études. In: Les cahiers de recherche en éducation et formation. 2009. No. 75, p. 3–32. FLORIDA, Richard L., 2002. The rise of the creative class: and how it’s transforming work, leisure, community and everyday life. New-York: Basic books. IAMMARINO, Simona, 2005. An evolutionary integrated view of regional systems of innovation: concepts, measures and historical perspectives. In: European Planning Studies. 2005. Vol. 13, No. 4, p. 497–519. KEATING, Michael, 2002. Governing cities and regions: territorial restructuring in a global age. In: Global City Regions. Oxford: Oxford University Press. p. 370–391. LAMBERT, Jean-Paul, 2013. Accès à l’enseignement supérieur : un enjeu politique et économique majeur. In: La Revue nouvelle. 2013. No. 12, p. 77–97. MALMBERG, Anders and MASKELL, Peter, 2006. Localized learning revisited. In: Growth and Change. 2006. Vol. 37, No. 1, p. 1–18. MOLITOR, Michel, 2010. Les transformations du paysage universitaire en Communauté française. In: Courrier hebdomadaire du CRISP. 2010. No. 2052‑2053, p. 1–100. MOULAERT, Frank and SEKIA, Farid, 2003. Territorial innovation models: a critical survey. In: Regional studies. 2003. Vol. 37, No. 3, p. 289–302. NASSAUX, Jean-Pierre, 2011. Le nouveau mouvement bruxellois. In: Courrier hebdomadaire du CRISP. 2011. No. 2103‑2014, p. 1–88. GRIGNON, Claude, 2000. Les conditions de vie des étudiants enquête OVE 1997. Paris: Presses universitaires de France. RUZB-CHAB, 2007, Universitaire Ziekenhuizen in België. Brussels: Raad van de Universitaire Ziekenhuizen van België – Conférence des Hôpitaux Académiques de Belgique. S.N., 2010. La société civile bruxelloise se mobilise. États Généraux de Bruxelles. Brussels : Le Cri. TAYLOR, Peter J. and ARANYA, Rolee, 2008. A global “urban roller coaster”? Connectivity changes in the world city network, 2000–2004. In: Regional Studies. 2008. Vol. 42, No. 1, p. 1–16. UNGER, J., VANDERMOTTEN, C., WAYENS, B., BRISMEZ, C., DUCHEZ, J. P, LAYLA, S., MAULET, G., VINCKE, F. M and CHARRUADAS, P., 2004. Itinéraire de l’Université libre de Bruxelles. Brussels: Société Royale Belge de Géographie. Hommes & Paysages. UNGER, Jonathan, 2005. Contribution de l’Université au développement de la Région de Bruxelles-Capitale. Brussels: Université libre de Bruxelles. Prospective Research For Brussels. VAN CAMPENHOUDT, Maud and MAROY, Christian, 2010. Profil des étudiants entamant des études universitaires et analyse des choix d’études. In: Les Cahiers de Recherche en Education et Formation. 2010. No. 77, p. 1–44. VAN WYNSBERGHE, Caroline, 2013. Institutional complexity as consesus model. In: The Brussels reader: a small world city to become the capital of Europe. Brussels: VUB Press. p. 94–107. VAESEN, Joost, 2008. Osmose, dwang en tegenmacht? De verhoudingen tussen de openbare besturen in Brussel, 1970‑2004. Brusels : Vrije Universiteit Brussel. VANDERMOTTEN, Christian, BIOT, Valérie and VAN HAMME, Gilles, 2007. Impact socio-économique de la présence des institutions de l’Union européenne et des autres institutions internationales en Région de Bruxelles-Capitale. Eléments de mesure. Brussels: IGEAT. VANDERMOTTEN, Christian, 2013. Brussels in the european city network. In: The Brussels reader: a small world city to become the capital of Europe. Brussels: VUB Press. p. 28–42. VERMANDELE, Catherine, PLAIGIN, Charles, DUPRIEZ, Vincent, MAROY, Christian, VAN CAMPENHOUDT, Maud and LAFONTAINE, Dominique, 2010. Profil des étudiants entamant des études universitaires et analyse des choix d’études. In: Les Cahiers de Recherche en Education et Formation. 2010. No. 78, p. 64. VINCENT, Anne, 2009. Les acteurs de la recherche en Wallonie et à Bruxelles. In: Courrier hebdomadaire du CRISP. 2009. No. 2016‑2017, p. 78. WITTE, Els and VAN VELTHOVEN, Harry, 2010. Strijden om taal: de Belgische taalkwestie in historisch perspectief. Antwerpen: Pelckmans. 1 In Anglo-Saxon literature, the term “university” usually refers to both universities and (university) colleges. In order to avoid the suggestion that in this Belgian-Brussels case we only discuss one type of institution, we will use the more general term “higher education institutions” (HEIs), although their activities are not restricted to teaching. 4 Université libre de Bruxelles (ULB), Université Saint-Louis Bruxelles (USL-B), Université Catholique de Louvain (UCL), Haute Ecole de Bruxelles (HEB), Haute Ecole de la Communauté française Paul-Henri Spaak, Haute Ecole Francisco Ferrer (HEFF), Haute Ecole Lucia de Brouckère (HELDB), Haute Ecole Galilée, Haute Ecole Léonard de Vinci (HELdV), Haute Ecole EPHEC, Haute Ecole Groupe ICHEC – ISC Saint Louis – ISFSC, Haute Ecole libre de Bruxelles Ilya Prigogine, Académie royale des Beaux-Arts de la Ville de Bruxelles – Ecole supérieure des Arts, Conservatoire royal de Bruxelles, Institut national supérieur des Arts du Spectacle (INSAS), École nationale supérieure des Arts visuels de La Cambre, ERG - École supérieure des Arts (Ecole de Recherche graphique), École supérieure des Arts Saint-Luc de Bruxelles, École supérieure des Arts du Cirque, École supérieure communale des Arts de l’Image “le 75”. 5 Vrije Universiteit Brussel (VUB), Hogeschool-Universiteit Brussel (HUB, which has an academic component and a high school component), Erasmushogeschool Brussel, LUCA School of Arts. 6 Vlerick Business School, Universiteit Maastricht – Campus Brussel, Brussels School of International Studies – University of Kent, Kobe University, American University, Centre international Lumen Vitae, United International Business Schools, Centre Européen de recherches internationales et stratégiques, Vesalius College, BBI Brussels Business Institute, CAD Centre des Arts Décoratifs, École Internationale de Théâtre LASSAAD, ECS European Communication School (formerly EFAP International), ESCG-École Supérieure de Communication et de Gestion, IEC Institut Européen de Communication, Institut Royal d’Histoire de l’Art et d’Archéologie de Bruxelles, Institut Rythmique Jaques-Dalcroze, SAE Institute Brussels, SUPINFO International University, UBI United Business Institute, FSIB Faculté des Sciences Islamiques de Bruxelles, Boston University in Brussels. 7 All of the data concerning students have been calculated for the reference year 2010‑11 based on data from Conseil des Recteurs des Universités francophones (CREF), ETNIC and Databank Hoger Onderwijs. The figures mentioned concern only students subsidised by the communities or the federal state (ERM-KMS), excluding students from international or private institutions. 8 Some universities or university faculties had been founded in Brussels before the independence of Belgium, but ceased their activities following independence. 9 In 1834, the state university of Leuven was abolished and the Catholic University of Leuven took over its premises. 10 There is however no sub-nationality based on language or other categories. The institutions, not the citizens, belong to one of the communities [Dumont and Van Drooghenbroeck, 2011]. 11 Students may be counted in three different ways: registration (but there are more students registered than there are students), the number of students (i.e. the number of individuals), and the number of students in terms of 60 completed ECTS credits (i.e. 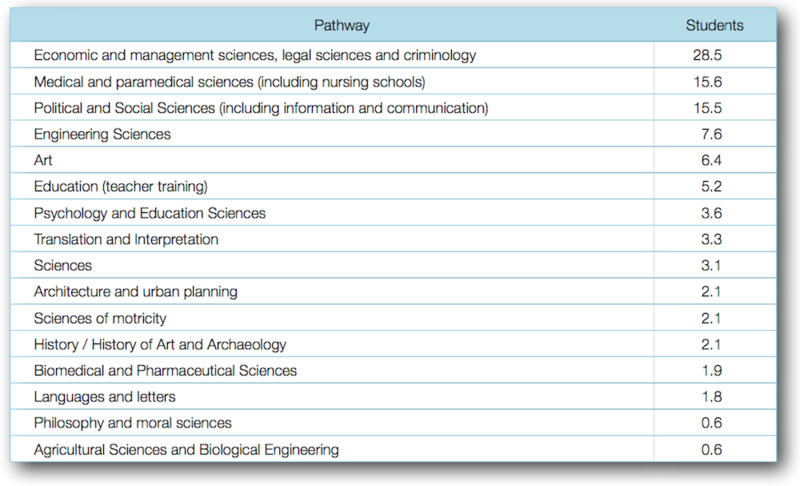 the number of full programmes in which students are registered). 13 Source: ADT-ATO survey among university students, 2013‑2014. Estimates are not available for colleges, but as their recruitment is more local and their provision essentially made up of short courses, the proportion of students who still live with their parents is probably much higher. 18 The success rate is approximately 40% in the first year of higher education [Service général du pilotage du système éducatif, 2013, pp. 66‑67]. This rate is comparable to the Flemish Community. Joost Vaesen has a doctorate in history. He is the director of the Brussels Studies Institute (BSI), which was set up by Université libre de Bruxelles, Vrije Universiteit Brussel and Université Saint-Louis – Bruxelles to support and further research about Brussels. He also teaches at Vrije Universiteit Brussel. His research is focused on the administration and functioning of Brussels and on education in the context of a big city. Benjamin Wayens has a doctorate in geography. As a research professor, his work at IRIB (Université Saint-Louis Bruxelles) and IGEAT (Université libre de Bruxelles) is focused on the geography of services and spatial analysis applied to urban observation and history. He also contributes to training in the area of geography and science for future primary school teachers at Haute Ecole Lucia de Brouckère. In this respect, he pays particular attention to the issues of education, training and popularisation. Since 2012, he has been Senior Editor of Brussels Studies.